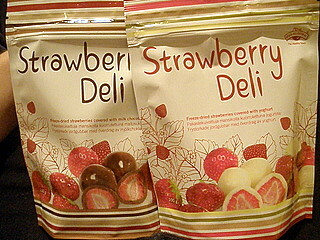 My fiance’s mother is well aware of my strawberry obsession and bought me these awesome chocolate-covered freeze-dried strawberries on the boat from Helsinki to Tallinn when they came for Christmas. Both bags have of course been consumed, so here comes a review! There were two different kinds, milk chocolate and yogurt. The product is made in the Netherlands and in the top right-hand corner of the front of the package it says “Green-All-Natural”, which sort of looks more like a brand name than a claim (but a glance at the ingredients reveals that they are indeed all natural). I was surprised by how big they were! 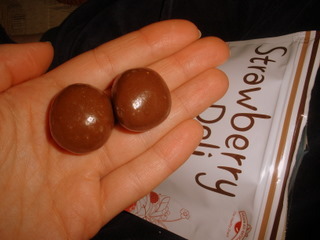 Each one is a whole freeze-dried strawberry with a healthy coating of chocolate or yogurt. The milk chocolate was very, very sweet. 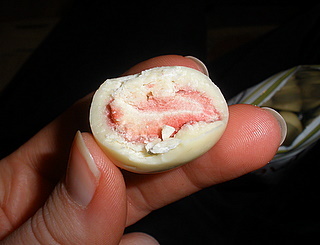 It was tempered somewhat by the natural tartness of the crispy, light-as-air strawberry in the center, but overall the sugar was still too much. They actually made my teeth hurt. In a few of them I came across strawberries that weren’t completely dried and retained some chewiness (they still tasted fine). The yogurt coating was also quite sweet, but ultimately I found it less overwhelming than the milk chocolate. The berry and coating were somehow in better harmony (of course– berries and cream are a natural combination!). Their size, sweetness and the resealable bag mean that even the small 100 g bag could last a while, as it only takes one or two of these unique “candies” to satisfy a sweets craving.